We offer the broadest range of AC and DC motor repair services available in the industry. Come and discover why we’re among the best in the industry, and see what savings you can give your company when you choose us for your next AC/DC motor build service. All motors undergo an extensive evaluation prior to any work beginning. All worn, damaged, or out of specification parts are replaced during the rebuild process and we change every bearing, every time. Because we are a One Source Solution we offer all these services in house, this enable us to provide you with a quality motor rebuild with the fastest turn around. We perform complete Electric Motor Rebuilds all in house including bearing changes, machining, rewinding, dynamic balancing and dyno testing. 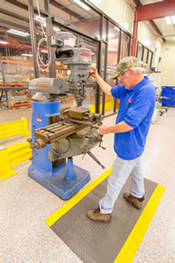 We perform complete electric motor rebuilds, both AC and DC motors, in our own facilities. You have leading industry technicians working on every step including bearing changes, machining, rewinding, dynamic balancing and dyno testing. These options let us know that your electric motor is back up to its full operational status and helps us ensure you will have the parts and service your equipment needs for a long operational life. Our goal in every build or repair is to get you back to OEM standards. We extend the same 18-Month In-Service Warranty to all of our builds and repairs, so you never have to worry about the quality of work you receive. As one of the few repair companies that offers in-house rewinding services, we have perfected the process of rewinding AC & DC motors to ensure an exceptional repair. Our DC and AC motor build service technicians will perform this task to maintain the overall efficiency and operational fortitude of your motor. Rewinding remains one of the best ways to maintain high efficiency after a motor fails. We can rewind your AC and DC motors as opposed to rebuilds or replacements and still deliver a standard repair time of one to five days, with one-day and two-day rush service available. And, our team of certified technicians knows to take extra care with your electric motor. So, our rewinding doesn’t result in overheated core laminations that can increase core loss. Our highly skilled technicians perform dynamic balancing to reduce vibration and to make sure your motor runs at peak performance. Full balance reports are available upon request. Dynamometer testing is the only way to put a 100% Full Load Test on your repaired Electric Motor. it is the process of your motor coupled with another motor that turn in opposite directions presenting resistance to each other, creating a load. We run these motors to maximum load to ensure you motor will be right the first time. We offer full AC & DC motor build repair services, meaning we have all the equipment necessary to properly inspect your motors, identify problems, make repairs, machine parts for replacements, perform builds and then perform a complete follow-up audit to ensure rebuild success. We specialize in having the knowledge, tools and expertise to get your rebuild done right. So, whenever you are in need of an electric motor repair, we offer full AC and DC motor repair services under one roof to keep your operations efficient and your ROI significant. Plus, all our repair and replacement services are backed by our promise, from the full warranty to beating any qualified bid by 10 percent or more. You’ll get access to both standard repair schedules as well as rush services, with factory technicians managing every step so there’s no loss of quality.